Ken Kopp is the proud owner of the first production SkyViews installed in an airplane. 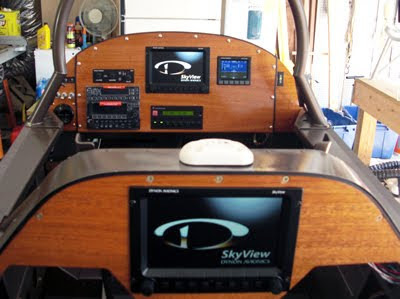 His two 7" Displays are shown here in his RV-8, along with an EFIS-D10A as an independent backup. In his words: "Received the SkyView system today. WOW! What a nice piece of engineering... I had pretty much everything ready to go based upon your documentation and the panels dropped right into place and installed in 5 minutes or so."